The US Army's development of the 37mm anti-tank gun began in response to needs identified during the Spanish Civil War. 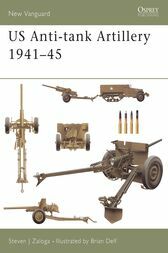 By the time it entered service in Tunisia in 1943, the gun was already obsolete, and the US began the licensed manufacture of the British 6-pdr in the hope of finding a quick solution to its artillery requirements. This in turn proved unequal to the demands of warfare in France in 1944, and further anti-tank measures were developed – rocket propelled grenades for infantry use, and weapons designed specifically for use by the Tank Destroyer Force. Brian Delf began his career working in a London art studio producing artwork for advertising and commercial publications. Since 1972, he has worked as a freelance illustrator, and has provided work on artillery subjects for Osprey ranging from Ancient Greece, through to the Napoleonic period, and up to World War II. Brian lives and works in Oxfordshire.